We Hadn’t Met for 12 Years! The Piedmont National Wildlife Refuge swamp was a Georgia treat! Mucky, dark, wet, oxygen challenged, strewn with foot catching snares, and who knew if any moment I’d be stabbed by an infectious armed vector (mosquito, tick or other micro-meanie). When I was given the mandatory dangers talk in the Refuge office, I actually thought: Look I survived many dangerous threats in my life, do I want, at this point to have a big as the head of a tiny pin vector of bacteria to do what knives, guns, garbage can covers or cars did not do? But Rose and Jerry were finding Satyr butterflies, and each time selflessly calling me to come and see this gem or that beauty. They were incredibly skilled at finding these low-flying, elusive butterflies, and I was having so much fun. When we finally left the swamp, Rose asked of butterflies I’d enjoy seeing. 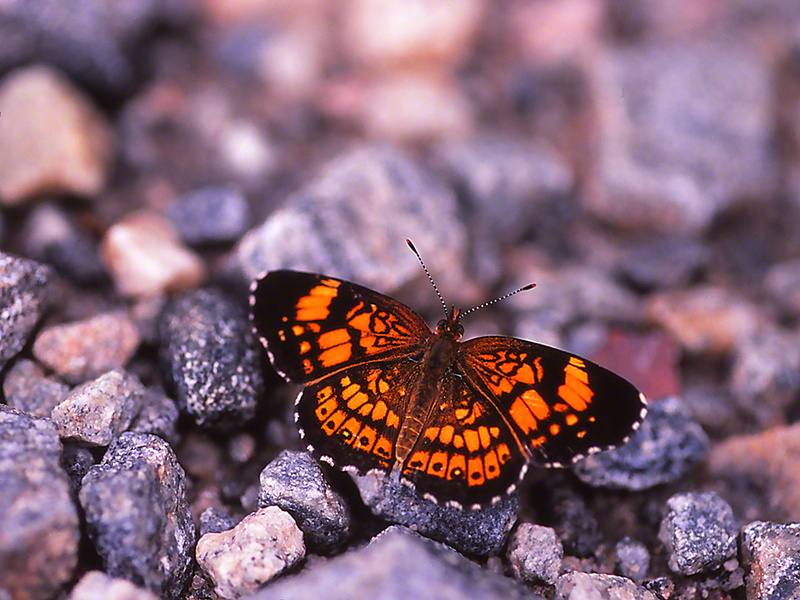 Somehow Silvery Checkerspots were mentioned. I had not seen one for 12 years. Off we went to a spot that they knew was good habitat for Chlosyne Nycteis. Still on Piedmont Refuge land, we arrived at a small retaining pond, and minutes later Rose spotted this Silvery Checkerspot. I made my approach, and when I got really close for my macro- shots, I saw that she was wonderful! Her forewing tips were especially dark and she bore the white-centered spots in her hindwing submarginal band. Like any top model, she cooperated. patiently awaiting my decision that I was satisfied with the exposures I had. Satyr butterflies count among my favorites. In Georgia August 2015, friends put me in contact with Jerry and Rose, a couple who know their butterflies. It was good news when they agreed to meet me in Piedmont National Wildlife Refuge. After a very serious Ranger acquainted me with the acute diseases that are carried by vectors in the swamp, I gulped, paused for thought, and . . . off the 3 of us went, to this wet, muddy, dark, humid, dank swamp. Jerry and Rose moved through the swamp like Antonio Brown of the Steelers traverses the field: with fluid moves, always moving, looking, searching, and seeking. They would call to me from here, then they’d disappear and call me from there. I didn’t admit it, but I was often out of breath. Oxygen seeming in limited supply in the swamp. So much was new to me there, and so much demanded your full attention and constant awareness of mud, critters and hazards. Satyrs were afloat, and this one here did the remarkable. It paused long enough for me to click, click, click, taking one photograph after the other. My Fuji film was challenged by the limited light. Many exposures proved to be useless, but not this one, with its dappled light coming down through the trees. 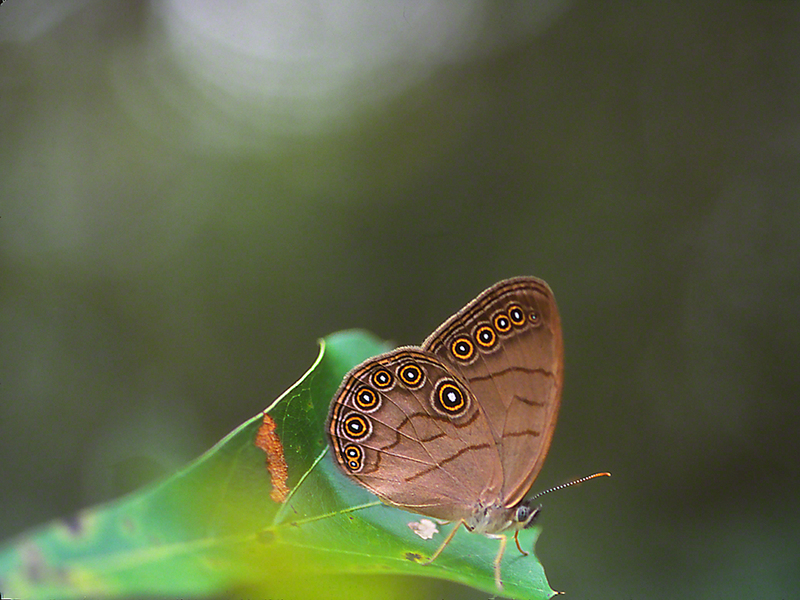 This sweet brown sugar of a butterfly is an Appalachian Brown (Satyrodes Appalachia). I love satyrs, they bring me back to the rich hues of brown offered in those upscale men stores on Madison Avenue in the 80’s, in their shoes, hat, and suits. A magical time for me then, and thanks to Rose and Jerry, I revisited browns with gusto in 2015. I drove the 4 hours from Eatonton, Georgia due south to Perry, Florida. I checked into the Hampton Inn, and with some help from the front desk staff, was in Big Bend Wildlife Management Area the next morning. Excited? Are you kidding? I hadn’t been to Florida since 1963, and now I’m back with camera, Fuji slide film, knee pad and all the rest of my gear. Butterflies of the Florida Panhandle, that’s what I came for. Total triumph is about the best way to describe those 4 sunny days. No feral dogs, no nasty critters, just a few ticks (Yes, Ugh!!! ), and so many butterflies that were new to me, or that I’d only since once or twice before. The thing was, not only were there winged beauties aloft and nectaring, but there were also flowers that I had never seen before, not even up in Putnam County, Georgia or at Piedmont National Wildlife Refuge or at Hard labor Creek State Park. Shoot or conserve film. You know how that worked out. Excellent example here. 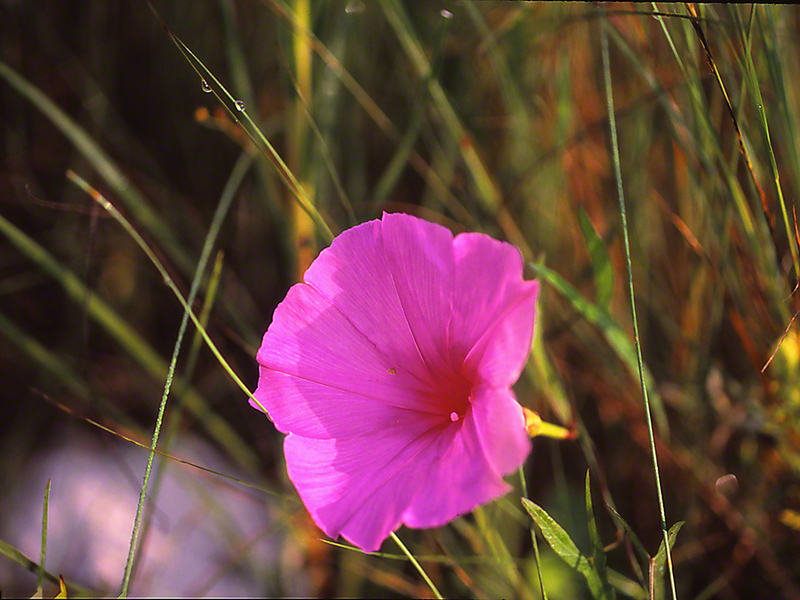 I approached this beacon of beauty, and must have said, “Hello, and who are you?” I shot away, knowing that much later I will find the name and info..
It’s a . . . Salt marsh Morning Glory (Ipomoea sagittata) and found along the coast from North Carolina down to Florida and westward to Texas. I liked/like it, and standing there before it, liked it alot. 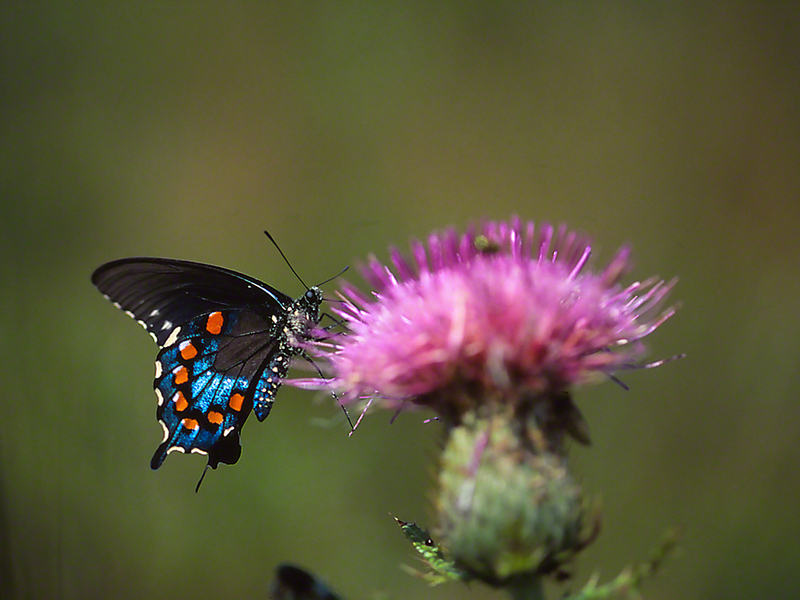 This night before Thanksgiving is a great time to share this I-like-it image of a Pipeline Swallowtail butterfly. Tomorrow most of us will sit down and give Thanks for all that we are blessed with. Once we are sated with scrumptious turkey and stuffings, some of us will head to the TV to enjoy football, others will find their way to their/his/her computer and check out their usual websites and blogs. I was reveling with my first meet-up with regal fritillary butterflies. It was June 10, 2015, and I was at their only refuge in the entire eastern United States: Fort Indiantown Gap Military Reservation in central Pennsylvania. During those hours, this delightful shmeksy, Battus Philenor flew onto the thistle flowerhead. I was pleased and impressed. This is one of those butterflies whose arrival nearly demands Hail to the Chief. No photoshop or equivalent. This one was a beaut, and Cech and Tudor, in their field guide Butterflies of the East Coast, note that these “dazzling” colors are no happenstance. They warn the usual suspects (predators) Uh Uh, I’m over the top toxic! Soon we’ll post an image of Regals mating. Timing, timing, timing. This was that sweet trail, Qedesh trail, in the Upper, Upper Galilee, Israel. Sweet? The month was March, the year, 2015. Winter rains were ferocious, and that meant . . . Spring blooms by the trillions. Surrounded by a sea of soft color, butterflies were everywhere, all on the move. That made it easier to stick to my determination to only photograph fresh, complete butterflies. Give a bird-struck (lizard, snake, beetle, mantid, etc.) butterfly a look, yes, but hold back, don’t shoot, because experience has shown that y’all are not anxious to see imperfect butterflies. Reality, No? 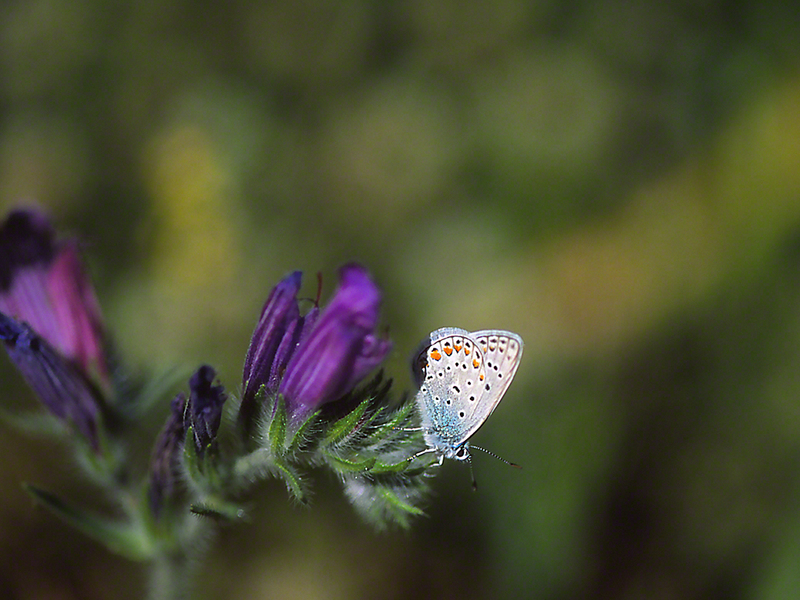 This blue may be one of several tiny blues that fly there, then. I like it, and I liked the blossoms on its perch. I liked the trail, I like that sunny day with its moderate temperature, and you know I took more than one opportunity to stop, and Thank G-d for enabling me. All that was missing that day, on that trail, was y.o.u.